Atheaton Traditional Hotel v Nafplio, Řecko: Zarezervujte nyní! If cancelled or modified up to 10 days before the date of arrival, the total price of the reservation will be charged. If modified later, the total price of the reservation will be charged. A unique guesthouse ''Atheaton '' is situated in the heart of the old town in Nafplion, at an ideal spot, nearby Saint Spyridon Square, gives you the chance to know Nafplio in the most pleasant and easy way. The traditional guesthouse Atheaton made with love and care. Our goals was to create a guesthouse which surprise the visitor and differs from the usual style of the ''pension'' or ''hotel''. From the moment you enter the reception, you will immediately feel that you are in a familiar place in this city of magical breeze and unique history. Everything is aimed at guaranteeing you a pleasant and comfortable stay. We believe that your vacation must combine luxury and relaxation in order to our sense, by the end of the holidays to have been filled out with images and memories. 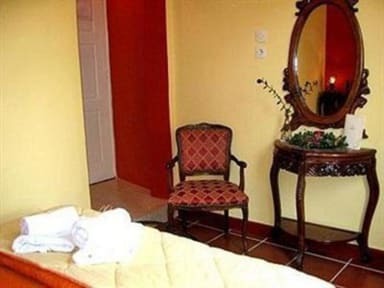 In the Guest House Atheaton you will find seven different beautiful rooms. Each room has its own name, its own separate color and consequently its own personality. The antique furniture, the mirrors, the handmade carpets and the renovated walls, are some of the details that makes Atheaton so unique. Atheaton Guesthouse is set between traditional houses, restaurants and shops and the hotel owners offer advice on places to eat and drink. Nafplio's main bus station is a few minutes' walk away. Guests can park at the nearby free public parking space. Staff here do all they can to make your stay enjoyable.